High Speed Gear Cobra 1.75" IDR Rigger Belt with Velcro FREE SHIPPING! When in the field or out on patrol, a lot of gear is required. The optimal way to transport all the gear is with a maximum strength duty belt. 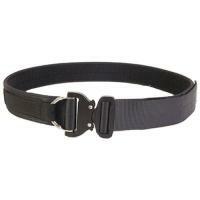 High Speed Gear has produced the Cobra 1.75" IDR Rigger Belt. Designed to deliver thick, stiff and dependable use, the Rigger Belt is constructed from two layers of military-grade, type 13 webbing. Each layer is coated with an industrial-strength laminate, then stitched together with five rows of high-test 138 nylon thread for a secure binding that will never unravel. With its superior rigidity, the belt does not sag under the weight of combat gear. An internal Velcro lining provides additional security when attaching holsters, pouches and other equipment. A specialized COBRA buckle ensures a secure closure that is guaranteed not to come loose, chafe the skin or rub uncomfortably. ©2002-2019 CopsPlus.com: High Speed Gear Cobra 1.75" IDR Rigger Belt with Velcro FREE SHIPPING!